In our present industralized society we can observe a similar relation between the way we refuse the presence of death, and the refusal to see what happens with our rubbish. As if the utilitarian way of consuming a product has inflitrated the way we consider our life and the life of those who will come after. In our reality, we are not interested to know what happens with the “object” after its “useful time period”. In this way we leave as inheritance a mountain of material and symbolic rubbish. If we can consider life, instead of linear and finished, as cyclical and infinite and if we can consider our existence as a part and not a whole, death would become a moment of transformation and transmutation, and an open possibility for another being or thing.Our workshop and performance will recreate a joyful funeral conceived as a Transformation Artifice. 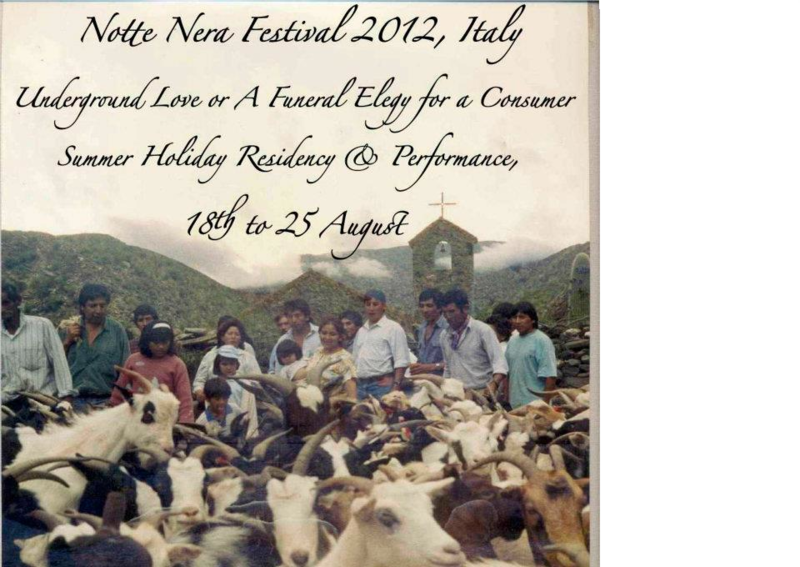 This 7 days workshop will end in a spectacle called ” Underground love or a funeral elegy for a consumer”, performed at the Notte Nera Festival(www.nottenera.it). Particpation in the performance is not compulsory and each participant can collaborate in the creative process in its own personal way. No special requisittes or previous artistic experiences are required to participate in it. The workshop will be given in Italian and English. The workshop will start with a dinner on the eve of the 18th . We will work and create for at least 6 hours each day, allowing time to enjoy the surrounding villages and nature and the nearby sea (Senigalia).